99 Ways to Get Chopped from “Chopped”: A Handy Tips-‘n’-Tricks Checklist « Midlife Crisis Crossover! 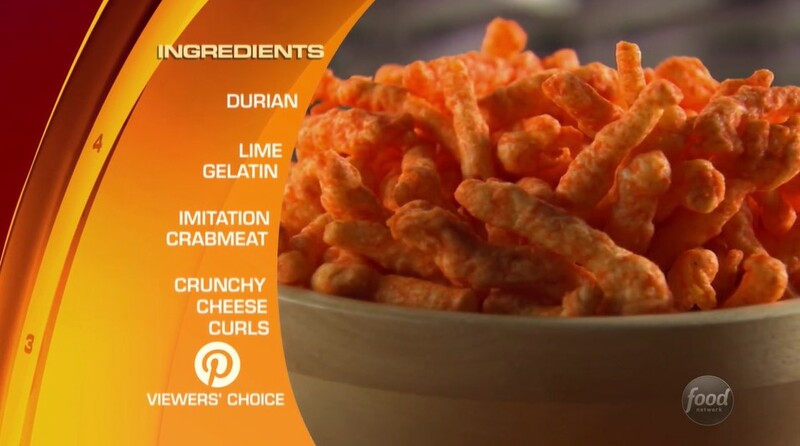 Who among us has never looked at a bag of Cheetos and thought, “I bet I could turn this into haute cuisine”? For years my wife Anne and I have been addicted to the Food Network’s cooking-competition series Chopped, in which four chefs must outcook each other under strictly timed conditions using four specific ingredients. Inside every Chopped basket of goods lurks a surprising combination of the rare, the delicate, the expensive, the complicated, the whimsical, the outlandish, and/or the thoroughly disgusting. Every substance can be used, though not every substance is very good. Food Network continues gifting us with new episodes every week hosted by the amazing colossal Ted Allen, who presides over this fast-paced showcase for chefs of every conceivable demographic from various American restaurants, caterers, bakeries, or other private businesses, each of whom keeps their eyes on the $10,000 prize to be had if they’re the last entrant remaining after three grueling courses of speed-heating, kitchen-racing, and power-serving. After watching several dozen episodes, Anne and I began to notice recurring patterns and tried to capture those observations and our fandom back in 2014 with a previous MCC entry called “How Not to Get Chopped from ‘Chopped’: A Starter Guide“. I’ve been meaning to overhaul that entry for a while now that we’re four years and literally 200+ episodes later, which includes every episode of the kids-only spinoff Chopped Junior and a handful of episodes of Chopped Canada, which was an interesting effort with its own angle and demeanor but wasn’t quite the same thing. I’m ashamed to confess it was tough to watch for more than a few minutes before I started poking fun in a goofy faux-Fargo accent. The following compilation is our revised armchair-chef advice for future would-be competitors on how not to do Chopped from where we sit. This list is doubtlessly far from complete, and we welcome any additions in the comments below, especially from those among you who can truly cook. Though neither of us is a trained gourmet by any stretch, we hope this helps someone out there anyway. If you raise a skeptical eyebrow at any of these, well…it’s positively flabbergasting how many of these downfalls we’ve seen happen in actual episodes at the hands of trained professionals who run fantastic eateries back home but who lose their poise in front of the cameras. Even the best can make mistakes or watch their plans spin out of control. Unnecessary disclaimer: exceptions can happen, but are extremely rare. We’ve seen at least two chefs with lousy attitudes win. We’ve seen rare instances in which hacking up an ingredient without any further treatment was secretly the best possible option. We once — exactly once — saw a single chef use white truffle oil without being chopped. Once. I love this. We’re big chopped fans. I have to show this to my husband. Thanks.